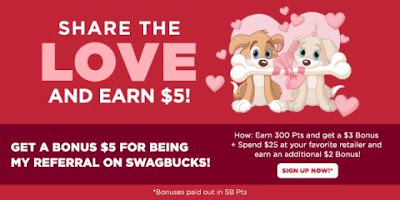 February is a month of love, and getting a $5 bonus from Swagbucks is their way of showing it! Swagbucks is a rewards site where you earn points (called SB) for things you're probably doing online already, like searching, watching videos, discovering deals, and taking surveys. Then you take those points and exchange them for gift cards to places like Amazon, Starbucks, Walmart, Target, or PayPal cash. 2. Earn 300 SB total before 3/1/17. You'll get a $3 (300 SB) bonus for it! 3. If you spend at least $25 through Swagbucks Shop* you'll get another $2 (200 SB) bonus on top of the cash back you'll get from shopping. If you have some shopping to do online, just go to Swagbucks first and visit the store through them. It doesn't cost you anything extra, but you'll get SB points for every dollar you spend (on top of the bonus)! That's it. It's super easy, and Swagbucks is for real. 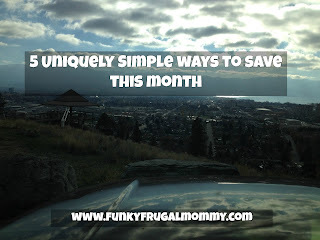 I use it myself, and I've earned tons of extra spending cash that I saved up for Christmas last year totaling over $500!